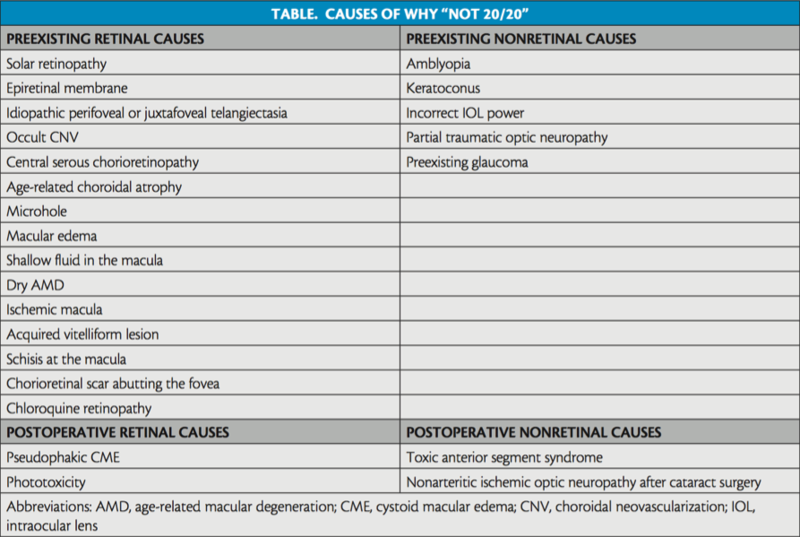 Why “Not 20/20” After an Excellent Phacoemulsification Surgery? Hazy media preoperatively may obscure subtle clues to retinal conditions. Advanced surgical techniques have improved the outcomes of cataract surgery and increased the expectations of patients and surgeons. Many a time, our anterior segment colleagues refer patients to us to find the reason why their vision is not 20/20 after an excellent phacoemulsification. In this article, we outline some of the reasons for “not 20/20” after an excellent cataract surgery. These causes may include preexisting conditions that could not be diagnosed preoperatively due to cataract haze or the subtle nature of the disease. Other causes could be postoperative and might require an advanced evaluation by a retina specialist (Table). • Detailed evaluation of the retina before cataract surgery is a must to avoid postoperative surprises. • Correlation between the patient’s visual acuity and the grade of cataract is important, especially with a history of any retinal condition. • Noninvasive tests such as OCT or autofluorescence may provide enough information to detect subtle changes at the fovea. Solar retinopathy is retinal injury caused by the photochemical effects of solar radiation, incurred due to directly or indirectly viewing the sun (eclipse retinopathy) or viewing ultraviolet or other bright light. This condition develops within 1 to 4 hours of solar exposure and manifests with unilateral or bilateral impairment of central vision and a small central scotoma. Visual acuity is variable according to the extent of damage. Dilated fundus examination shows changes that are variable and usually bilateral. Mild cases often show no alteration, and moderate to severe cases show a foveal yellow spot on the first days after exposure. After a few days this is replaced by a reddish dot, often surrounded by pigment. No treatment is available. Prognosis is good in most cases, with improvement of visual acuity to normal or near-normal levels within 6 months, although mild symptoms may persist. Features of solar retinopathy may be difficult to diagnose through the hazy medium of cataract. 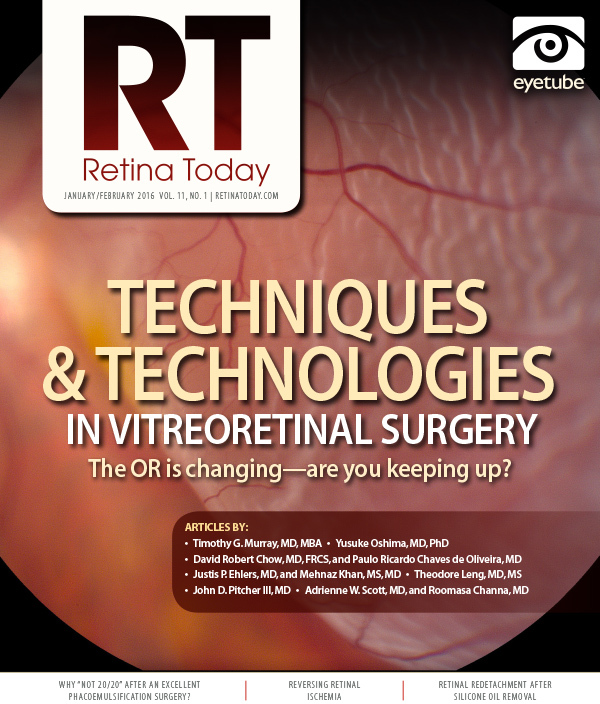 A detailed history may raise suspicion of this condition preoperatively, and optical coherence tomography (OCT) showing thinning of the fovea and/or outer retinal damage can help to confirm the diagnosis. Figure 1. Color fundus photograph shows ERM (TOP); corresponding OCT image shows incomplete posterior vitreous detachment along with ERM (BOTTOM). Idiopathic epiretinal membrane (ERM) usually presents in patients older than 50, a period that corresponds to the age of cataract formation. ERM can be missed by the anterior segment surgeon if it is in an early stage. The dull reflex from the fovea may be masked by haziness due to cataract. Clinical features vary from no symptoms to blurred vision, metamorphopsia, and diplopia. Fundus evaluation may reveal straightening or tortuosity of vessels or foveal ectopia (Figure 1). Preoperative OCT can be a good noninvasive tool to rule out the presence of ERM before cataract surgery. Depending on the stage of the ERM, cataract surgery can be combined with ERM removal after detailed patient counseling. The occult form of wet age-related macular degeneration (AMD) presents with metamorphopsia and gradual vision loss. A positive scotoma and blurring of central vision due to leakage of fluid from the choroidal neovascularization (CNV) may be present. Many times such occult membranes cannot be identified ophthalmoscopically. Subretinal pigment epithelium (sub-RPE) CNV type 1 appears as a gray-green or pinkish-yellow slightly elevated lesion. Subretinal CNV type 2 may be seen as a membrane. If there is high suspicion on OCT, the diagnosis should be further investigated with FA or indocyanine green angiography. The presence of shallow subretinal fluid secondary to central serous chorioretinopathy (CSCR) can be missed due to a hazy view before cataract surgery. CSCR causes blurred or distorted vision (metamorphopsia) with visual acuity varying from 20/30 to 20/200. The condition can worsen due to postoperative steroid medication after cataract surgery. Reduced visual acuity may persist after the fluid has disappeared due to changes in the RPE, and this can be another reason for “not 20/20” after cataract surgery. The path to diagnosis usually begins with a dilated examination of the retina, followed by confirmation on OCT and FA. Figure 2. Spectral-domain OCT image shows presence of microhole (outer lamellar defect). Spaide described this distinct entity, which is not AMD, and termed it age-related choroidal atrophy.3 Loss of visible choroidal vessels and decrease in choroidal thickness on OCT are considered to be the causes of vision loss in this condition. These features may not be well appreciated in preoperative examination; however, preoperative potential acuity meter (PAM) testing may help to predict postoperative visual acuity. A microhole may not be detected in the presence of a moderate to severe cataract. Postoperative vision can be 20/20 despite a microhole, although the patient may complain of “imperfect vision.” OCT examination is useful in diagnosing the breach in the outer retinal structures (Figure 2). Subtle macular edema due to previous vascular disease such as old tributary vein occlusion or old branch vein occlusion could be missed before cataract surgery due to absence of obvious signs of vascular disease. Postoperative FA may show the presence of small collateral or telangiectatic vessels due to old venous occlusion. Sometimes, in the absence of posterior vitreous detachment, as in a dialysis-associated retinal detachment, fluid at the macula can be so shallow that it cannot be seen clinically, especially through a cataract. OCT examination may be necessary to diagnose shallow fluid, in which case further evaluation is required. An early form of dry AMD, including subfoveal drusen or geographic atrophy abutting the fovea, can be a cause for “not 20/20” vision after cataract surgery. Autofluorescence and OCT imaging can be helpful to provide information about the status of the retina and RPE at the fovea. Preexisting diabetic macular edema or venous occlusion may be associated with an ischemic macula, which may not be obvious preoperatively. A detailed history and correlation with the patient’s vision and grade of cataract may be helpful to avoid postoperative surprises. Figure 3. Color fundus photograph shows a yellowish lesion at the fovea (TOP). 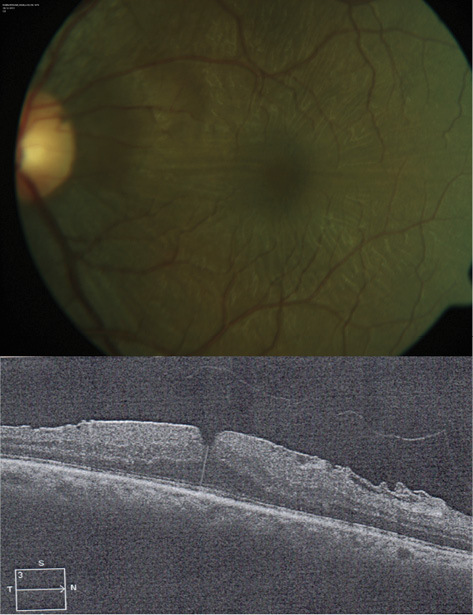 Spectral-domain OCT shows subretinal hyperreflective material suggestive of acquired vitelliform lesion (BOTTOM). A schisis involving the fovea may be associated with high myopia or with an optic disc pit. OCT examination can be helpful in making the diagnosis. Presence of a chorioretinal scar due to previous choroiditis near the fovea should always be evaluated thoroughly before cataract surgery. Involvement of the fovea should be evaluated by autofluorescence, OCT, or FA. PAM testing may provide information about visual prognosis after cataract surgery. Chloroquine retinopathy, also known as bull’s-eye maculopathy, usually occurs in patients undergoing treatment for autoimmune disorders such as rheumatoid arthritis or systemic lupus erythematosus. Premaculopathy is characterized by normal visual acuity but a scotoma to a red target located between 4° and 9° from fixation. Amsler grid testing shows a defect. If the treatment is discontinued, visual function usually returns to normal. Early maculopathy is characterized by a modest reduction of visual acuity (20/30 to 20/40). Fundus examination shows a subtle bull’s-eye macular lesion characterized by a central island of pigment surrounded by a depigmented zone of RPE atrophy, which itself is encircled by a hyperpigmented ring. The lesion may be more obvious on autofluorescence than on ophthalmoscopy. This stage can be missed before cataract surgery. A subtle amount of vision loss due to amblyopia can be present before cataract surgery. During axial length measurement for IOL calculation, anisometropic amblyopia may be suspected. However, sometimes it is not until a detailed postoperative evaluation, including normal retinal examination, that amblyopia is revealed as the cause of “not 20/20” vision. Forme fruste keratoconus is unlikely to be suspected as a diagnosis when a patient presents with cataract because the cylindrical power in his or her refraction can be confused with normal astigmatism. Patients with early keratoconus typically notice minor blurring of their vision and come to their clinician seeking corrective lenses for reading or driving. At early stages, the symptoms of keratoconus may be no different than those of any other refractive error of the eye; however, a detailed examination and careful keratometry may reveal the condition. High astigmatism should always raise suspicion of forme fruste keratoconus. Despite good cataract surgery, vision will not be 20/20 if an incorrect IOL power has been calculated. If anterior and posterior segment examinations are within normal limits, this points toward refractive error as the cause of decreased vision. Retrospective review of the IOL power calculation, especially in cases of toric IOL implantation, may reveal the cause of the error. The diagnosis of traumatic optic neuropathy (TON) is made clinically based on history and ophthalmic signs. Vision loss due to TON may range from 20/30 to no light perception. As in other optic neuropathies, patients with TON may have decreased central visual acuity, decreased color vision, an afferent pupillary defect, or visual field deficits. It is important to remember that, although this is rare, TON can be bilateral; therefore, afferent pupillary defect may not be seen in patients with bilateral injury and vision loss. The optic nerve head will appear normal initially, but optic atrophy can be seen 3 to 6 weeks after the initial traumatic event. Sometimes the clinical findings may be so subtle that slight vision loss due to TON can be missed before cataract surgery. Inability to evaluate specific findings such as disc notching during preoperative evaluation may make further evaluation necessary postoperatively. Pseudophakic cystoid macular edema (CME), also known as Irvine-Gass syndrome, is one of the most common causes of visual loss after cataract surgery. Phacoemulsification and small-incision cataract surgery have significantly reduced the incidence of pseudophakic CME, but, because cataract surgery is the most commonly performed surgery, pseudophakic CME remains a commonly encountered morbidity. The occurrence of pseudophakic CME peaks at approximately 4 to 6 weeks postoperative. The most common presentation is blurry vision. 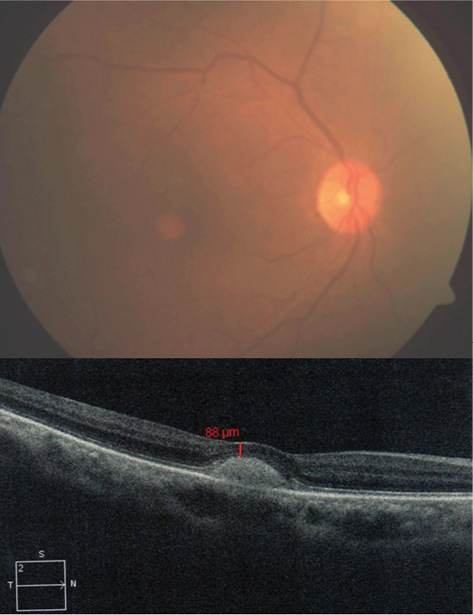 Fundus examination can reveal macular edema; however, it can sometimes be diagnosed only with the use of OCT. Subtle edema on OCT can be the cause of imperfect vision after cataract surgery. FA can be helpful, showing perifoveal hyperfluorescent spots in late phase frames. Topical NSAIDs are the mainstay of perioperative prophylaxis against pseudophakic CME. With the improvement of cataract surgical instrumentation and the advent of shorter durations of cataract surgery, iatrogenic phototoxicity is now a rare occurrence. Postoperative examination reveals yellow hypopigmentation at the macula with RPE atrophy. No treatment is beneficial; minimal surgical time is the key to prevention. 1. Charbel Issa P, Holz FG, Scholl HP. Findings in fluorescein angiography and optical coherence tomography after intravitreal bevacizumab in type 2 idiopathic macular telangiectasia. Ophthalmology. 2007;114:1736-1742. 2. Issa PC, Gillies MC, Chew EY, et al. Macular telangiectasia type 2. Prog Retin Eye Res. 2013;34:49-77. 3. Spaide RF. Age-related choroidal atrophy. Am J Ophthalmol. 2009;147:801-810. 4. Freund KB, Laud K, Lima LH et al. Acquired vitelliform lesions: correlation of clinical findings and multiple imaging analyses. Retina. 2011;31:13-25. 5. Marmor MF, Kellner U, Lai TY, et al. Revised recommendations on screening for chloroquine and hydroxychloroquine retinopathy. Ophthalmology. 2011;118:415-422. 6. Mamalis N, Edelhauser HF, Dawson DG, et al. Toxic anterior segment syndrome. J Cataract Refract Surg. 2006;32:324-333. 7. Hattenhauer MG, Leavitt JA, Hodge DO, et al. Incidence of nonarteritic anterior ischemic optic neuropathy. Am J Ophthalmol. 1997;123:103-107.